The Atacama Desert, which stretches 600 miles (1,000 kilometers) from Peru's southern border into northern Chile. This massive, barren landscape consists of expansive salt flats, out of which towering volcanoes extend, reaching twenty thousand feet into the sky. The Atacama Desert is known to be the driest desert in the world, with a landscape resembling that of Mars. The Atacama Desert is also famous for geoglyphs - sprawling, puzzling ancient artwork that are drawn into the landscape. 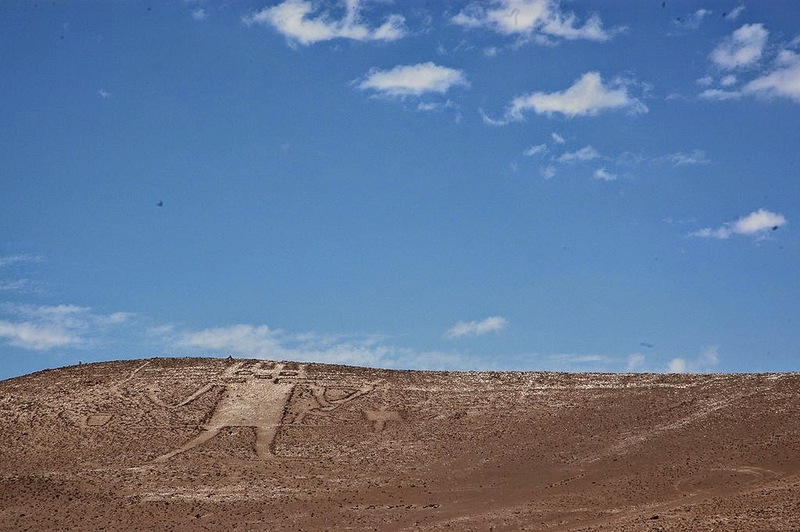 Nearly 5,000 geoglyphs have been discovered in the Atacama in the last three decades. 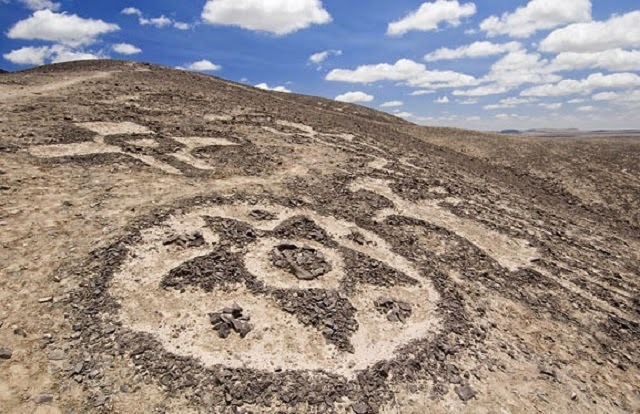 Scientists believes that these ancient artwork may be 2500 years old.The Atacama Geoglyphs are more numerous and widespread than their more famous counterparts at Nazca. They can be found in an area of over 100 square miles . They depict many subjects, Llamas and similar animals e.g. vicunas. Lizards, fish, birds, crosses, humans, chessboards and other geometric designs. They can be found alone or in groups some as many as 65 geoglyphs. The smallest figure is about 1m tall and the largest the Atacama Giant 115m high. They are found near major trade routes in the area and like all geoglyphs can only be seen from the air. In the specific focus of geoglyphs, there are two techniques by which they are created. The “extractive” technique, the more common of the two, involves scraping away the top layer of soil on the hillside, allowing for the soil beneath to create distinguishing designs on the surface. The “additive” process entails gathering materials such as rocks and piling them on the soil surface to create a raised outline. In the extractive process, the designs will appear lighter than the surrounding soil and in the additive process the designs will appear darker. There is also a third technique that is a complex combination of the additive and extractive processes which allows for a combination of light and dark colored figures . Very less is known about the ways in which they may have been used in the past. The most recent research into the purposes of geoglyphs has revealed that many of the figures can be directly related to migration routes of the early desert peoples.